Lets be honest, the Holidays are expensive enough with all the gifts your buying and whatnot. I want my house to look festive and expensive without actually being expensive! Since I just moved into my apartment this past year, I had NO holiday decorations. So of course the first thing I did once December rolled around was figure out what I was going to do for Christmas decorations! The first thing that needed to be picked up was a Christmas tree. I've never had a real tree before, and honestly my apartment is wayyy too small for a 6ft Christmas tree. So I opted for the fake 4ft tall kind that you can buy from Target on sale for $75. Next: Baubles. 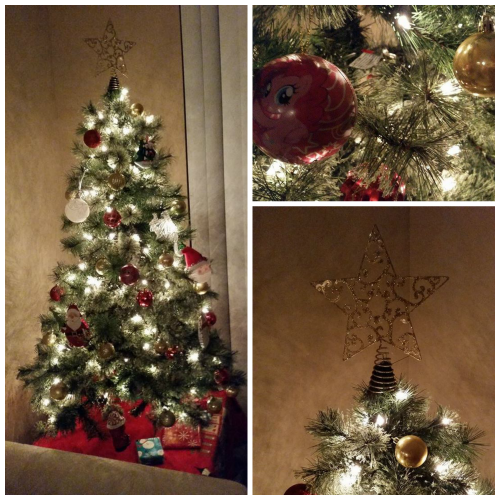 I opted for the classic red and gold theme for the tree, although I really wanted to do an all white theme. $1 store, here we come. I bought all of our tree baubles AND the star for the tree at our local Dollar store. And honestly, I think it turned out pretty nice. I have to admit though, some of the ornaments were not from the dollar store. 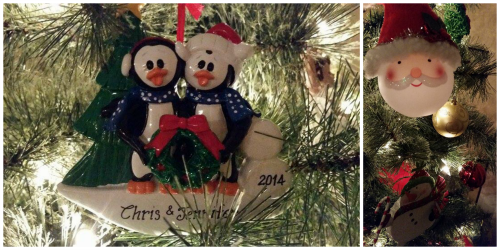 My Grandma loves the Christmas store, and when she went there she bought a ton of absolutely adorable ornaments. And she even got one to commemorate our first Christmas actually living together. 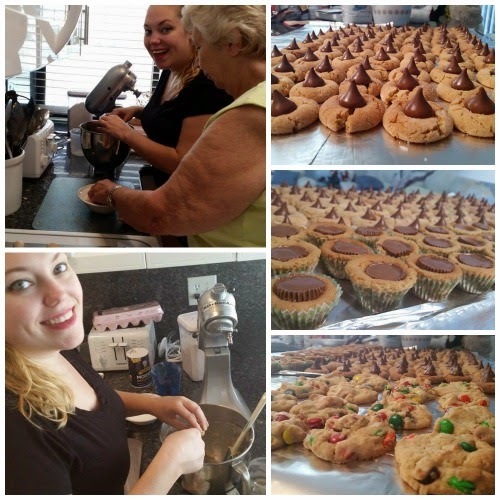 Now last weekend I went to my Grandmas house with the intention of baking about a billion cookies. And while she definitely did, I made about 3-4 types before I had to go for dinner with my Mom & Dad. Grandma didn't want her picture taken while we were baking, but here are the (fresh) fruits of our labor. Top right: Peanut Butter Blossoms. What that basically means is that I make delicious peanut butter cookies with wayyy too much peanut butter (so says Grandma, pssh what does she know about "too much peanut butter") and while they are hot you smoosh a Hershey kiss right in the middle of it. They are delicious and my favorite. Middle right: Reeses cup cookie. Basically all of the above but instead of a traditional cookie you put the batter in a mini cupcake paper, bake it, and then smoosh a peanut butter cup in the middle. Bottom right: M&M Cookies. You know what those are! Cookies with M&M's in them! All made from scratch except for the candies. Buster what are you doing in there?! 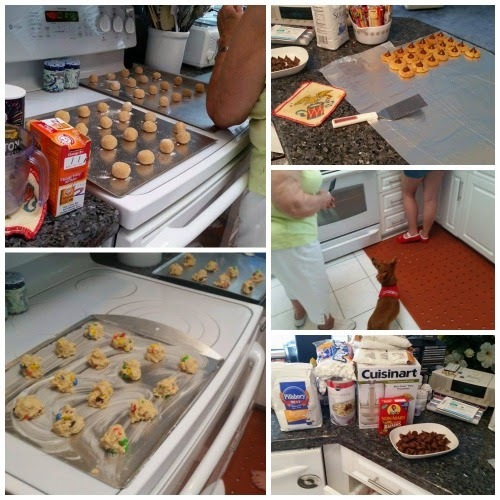 Puppies can't bake cookies! After these pictures there ended up being quite a few more cookies. Sugar cookies, chocolate with powdered sugar, chocolate chip coconut cherry, and another kind that I still to this day do not know the name of but they are delicious.